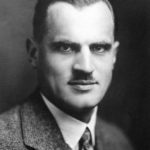 Arthur Holly Compton was an American physicist who won the Nobel Prize in Physics in 1927 for his 1923 discovery of the Compton effect, which demonstrated the particle nature of electromagnetic radiation. It was a sensational discovery at the time: the wave nature of light had been well-demonstrated, but the idea that light had both wave and particle properties was not easily accepted. He is also known for his leadership of the Manhattan Project’s Metallurgical Laboratory, and served as Chancellor of Washington University in St. Louis from 1945 to 1953. "It is not difficult for me to have this faith, for it is incontrovertible that where there is a plan there is intelligence – an orderly, unfolding universe testifies to the truth of the most majestic statement ever uttered – ‘In the beginning, God.’"
"Every great discovery I ever made, I gambled that the truth was there, and then I acted in faith until I could prove its existence."